The revelation — while laced with uncertainty — indicates that the ongoing cases Mueller handed off could still feature significant developments. The special counsel grand jury that investigated Russian collusion into the 2016 presidential election is “continuing robustly” despite the end of Robert Mueller’s probe, a federal prosecutor said in court Wednesday. The revelation — while laced with uncertainty — indicates that the ongoing cases Mueller handed off after concluding his probe could still feature significant developments, legal experts said. David Goodhand, an assistant U.S. attorney, acknowledged the grand jury’s active status during a hearing in U.S. District Court over a push to unveil the identity of a foreign state-owned firm that has been held in contempt for defying a Mueller subpoena. The mystery company’s case was denied a hearing before the Supreme Court earlier this week, and in the meantime, the open government group Reporters Committee for the Freedom of the Press has sought access to all materials in the clandestine litigation, including the company’s identity. 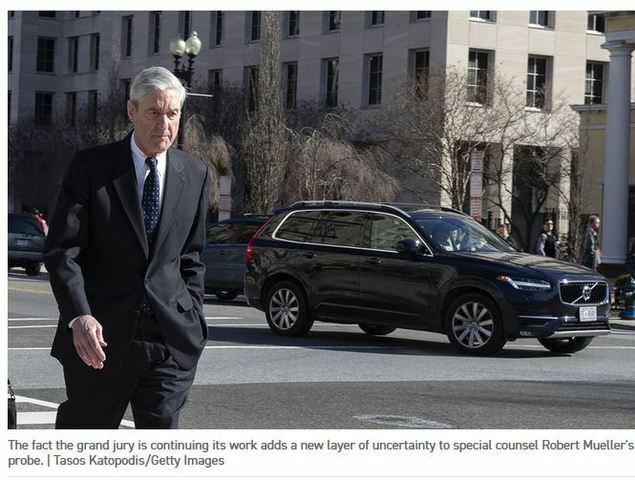 During a brief open hearing Wednesday, the chief judge of the U.S. District Court for D.C., Beryl Howell, pressed Goodhand to say whether the grand jury Mueller had been using in the case remained active. The fact the grand jury is continuing its work adds a new wrinkle to the Mueller probe, which Attorney General William Barr announced on Friday was finished. Barr released a four-page summary saying the special counsel had not found a conspiracy between Trump’s campaign and Russia to sway the 2016presidential election. Barr also noted that Mueller had not reached a conclusion on whether the president had obstructed justice. The attorney general then made a separate judgment that the obstruction evidence did not prove a crime. Additionally, the attorney general said Mueller had no more indictments — either to be released or under seal — in the case. Mueller’s office in recent days has been handing off a series of its cases to federal prosecutors across the government as it closes up shop. That includes the mystery subpoena fight that’s been ongoing since last year. The U.S. Attorney’s Office in Washington, D.C., where Goodhand works, is now leading the subpoena fight, as well as Mueller’s upcoming trial in November against longtime Trump associate Roger Stone and the eventual sentencing for former Trump campaign deputy Rick Gates. Mueller spokesman Peter Carr declined to comment on the federal prosecutor’s statement in court about the active grand jury. Theodore Boutrous, the lead attorney for the Reporters Committee, said he welcomed the revelation and the questions it raises about the direction of the Russia investigation that DOJ had otherwise announced was over. “That to me is fascinating. It’s worth doing it for that,” he said. Several legal experts offered their own theories about the Mueller grand jury’s status. Samuel Buell, a former federal prosecutor teaching law at Duke University, said the grand jury could still be meeting “on drain the swamp cases” akin to the one brought against former Trump campaign chairman Paul Manafort and Gates for failing to disclose foreign lobbying activity. He noted that one of the lead Mueller prosecutors in the Manafort-Gates case, Brandon Van Grack, is leading a new DOJ unit assigned to enforcing that law. Others said the grand jury’s continued presence could pose an ongoing headache for President Donald Trump, who since Sunday has misleadingly hyped Barr’s letter about the end of the Mueller probe as a complete exoneration. "I worked with the prosecutor [Goodhand] in this matter,” said Gene Rossi, a former assistant U.S. attorney in Virginia. “He uses his words very carefully. The use of 'robustly' is not bluster or gratuitous. That word strongly suggests that the handoffs from Robert Mueller's office are alive and kicking and that the Washington U.S. Attorney's Office could be another troubling front for the president and the White House." As she weighed the request to lift the curtain on the company’s identity Wednesday, Howell made it a point to ascertain whether the grand jury that’s been meeting since mid-2017 still has work to do. The mystery firm’s lawyers have argued the company should not be subject to a subpoena because it’s entirely foreign government-owned and complying with the subpoena would break the foreign country’s laws. On Monday, the Supreme Court turned down the firm's appeal, leaving a pair of lower court decisions in place. The company is also currently subject to a $50,000-a-day legal fine as long as it refuses to turn over requested information. So far, it has racked up more than $2 million in penalties. In court Wednesday, Goodhand said the government still opposes the release of the foreign company’s name. So did Brian Boone, a partner at Alston & Bird who is representing the firm. “My client would prefer to not have his identity be disclosed to the public,” Boone said. Howell asked Boone to explain why there’s still a need for secrecy. “I’d prefer not to in a public a hearing," Boone replied.